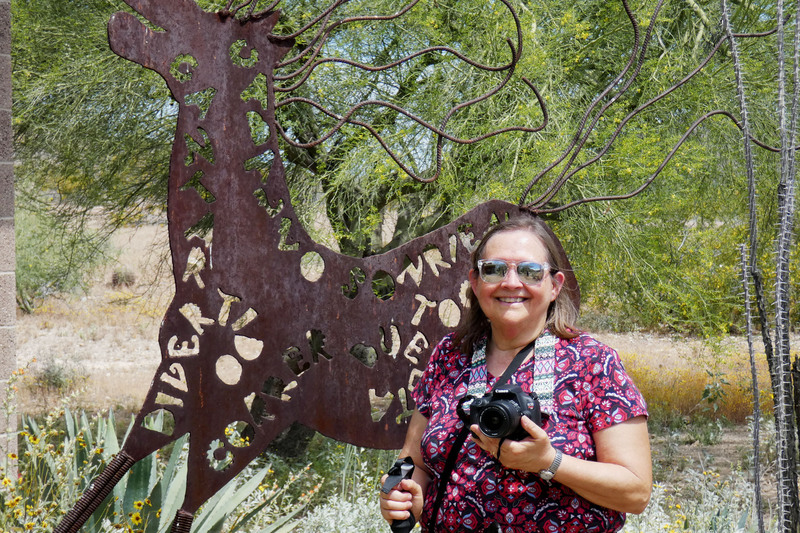 On my trip to Phoenix earlier in April, I got to meet up with a blog friend, Andrea Huelsenbeck. I have been following Andrea’s blog, ARHtistic License, since Sept. 2015! We are both artsy, readerly, writerly types with a love of nature. 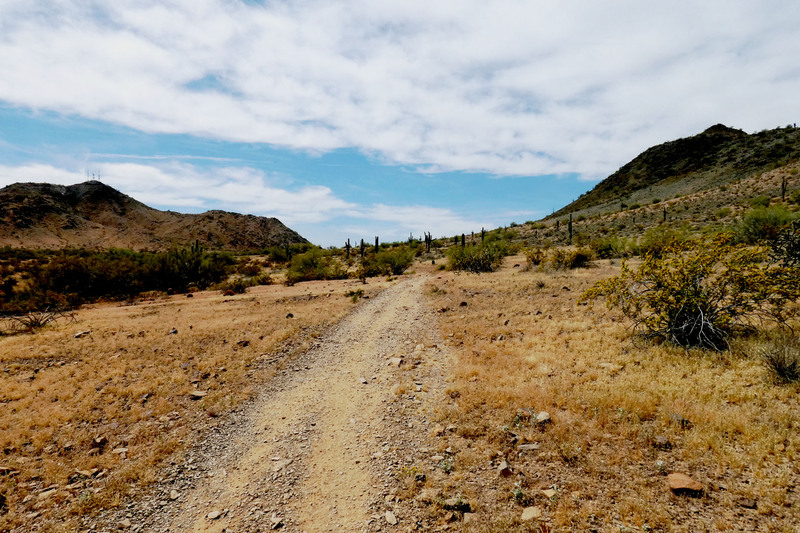 This past January, Andrea wrote about hiking at South Mountain Preserve, and that sounded familiar to me. 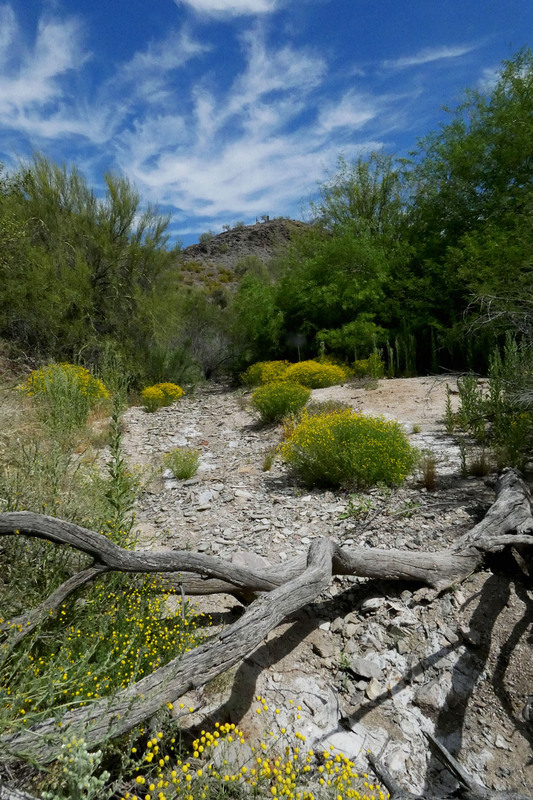 It turned out that on my only previous trip to Phoenix, I had stayed right across from North Mountain Preserve. So I checked to see if she wanted to meet and hike this park together, and she was up for it. 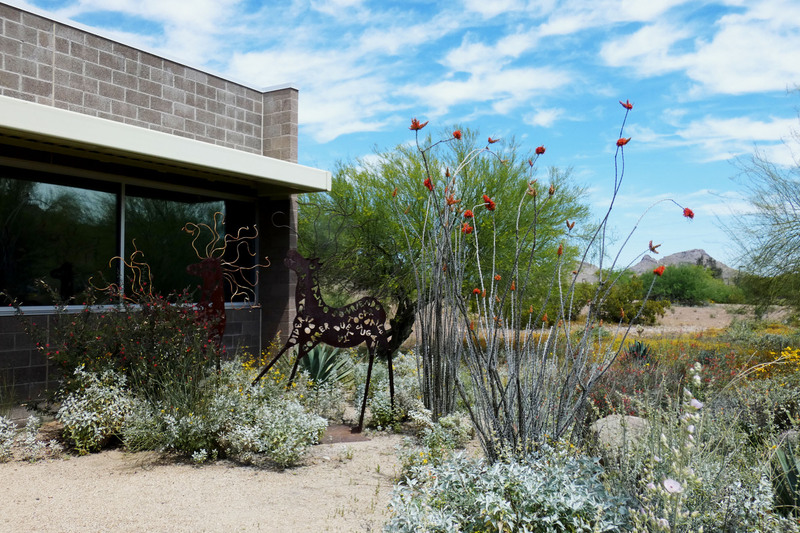 North Mountain Preserve Visitor Center, with ocotillo and sculpture. I got to the preserve before Andrea did, and had a lovely time looking around. The volunteers were very friendly and helpful, and the book shop had plenty of choices I hadn’t seen before. Andrea got there about 9:45 — and it just so happened that the moment she got there, I was on the phone with my neighbor who was chasing a snake out of my chicken hutch. But finally we were able to formally meet! It was an unseasonably warm day, so we got onto the trail before we even did much chatting. The trail was flat and easy to follow, but I think we still get points for being on it in 90 degree weather. I definitely got the best of this deal — Andrea had to fight through Phoenix traffic to get to North Mountain. She is used to steeper trails, but this one was practically flat, which was great for me. Where I live there are very tiny rolling hills, nothing like the steep peaks around Phoenix, so I would not have been able to keep up. Andrea had even come out a week earlier to get familiar with the trail, so all I had to do was follow her lead. We did a gentle loop trail, stopping to take pictures, but mostly doing a lot of talking. Andrea stops to take pictures. I got some birds for my life list, including Gambel’s Quail, Verdin, and Anna’s Hummingbird. It was so bright outside that I couldn’t see my view screen, so I just snapped away hoping for good results. 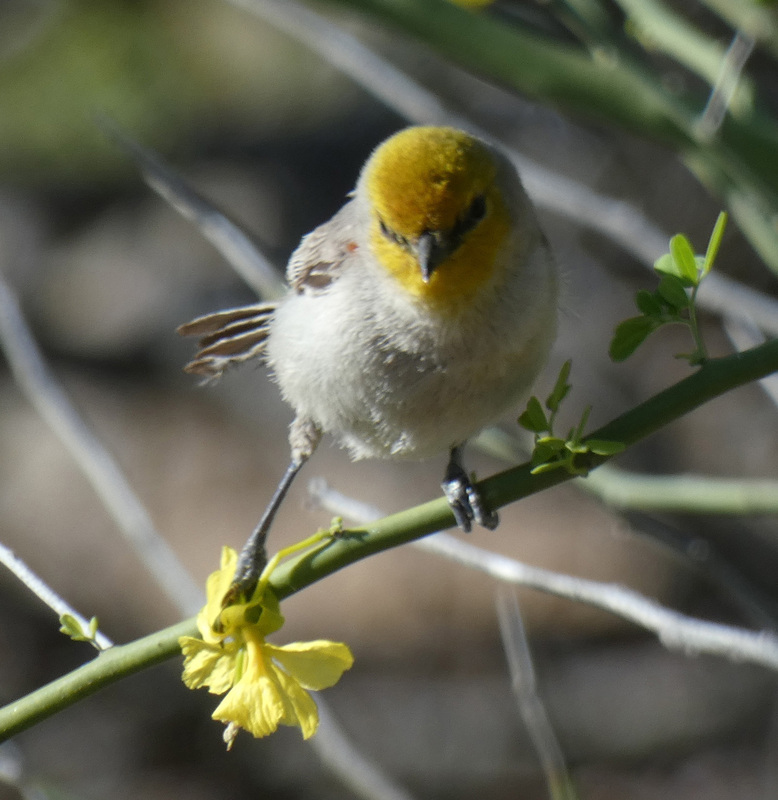 This Verdin was a life bird for me. 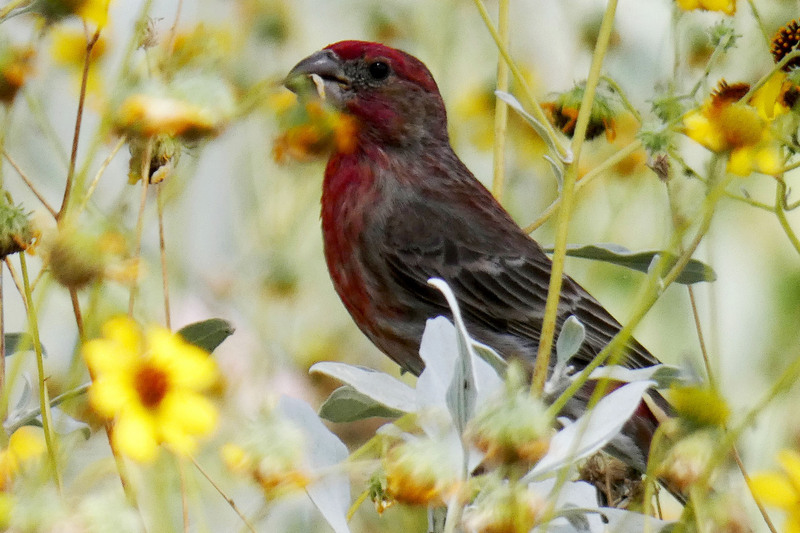 House Finches are so common but this one looked pretty among the yellow flowers. Andrea at the end of our hike. c) hadn’t gotten to know someone through their blog! This was one of those adventures and friends that blogging led me to, and I am glad it did! And you can read Andrea’s take on our adventure here! These are beautiful pictures–I especially love the birds! I also love what you said about the things that blogging has lead you to. I’m pretty new to blogging and I’m really appreciating all the things I’m learning just by diving deeper into my blog as well as others. I visited your blog and you are putting together great information! Thank you so much! I’ve been a fan of your blog for a while! The bird shots are fabulous, Ranger! 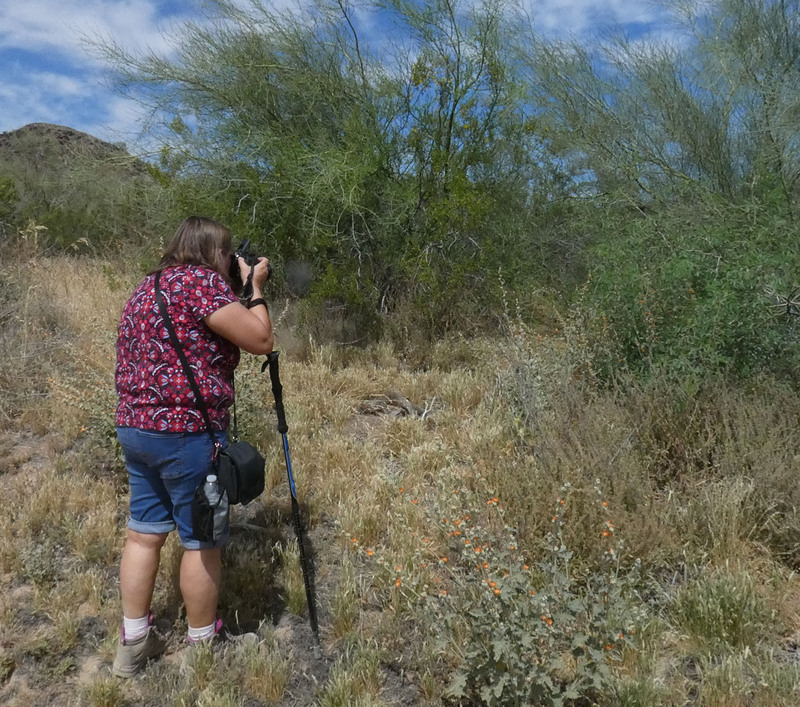 If only my Gambel’s Quail shots had turned out! But that Verdin shot made up for all the ones where the camera focused on twigs instead of birds. I was so grateful it came out in the open! This is great! I haven’t had a chance to meet blog friends face-to-face and I always wonder about it. You two seem to have had a great time and she has a very cute photo of you on her blog!